See the beauty in others. See the beauty in yourself. See the beauty in the mundane, in the sadness & the pain. See the beauty surrounding us everyday. Hi, I’m Metta. A momma to three, wife to one & a daughter to two. I am creating & building my life on beautiful Salt Spring Island, in BC Canada. I am lucky enough to have spent all of my life here, born and raised, other than those 10 years where I lived in the big ol’ city of Vancouver. For as long as I can remember, or at least all of my adult life, I have always been drawn to so many things, with such drive & passion, until that fades and I then am drawn to something else. And the cycle begins again. And again….get the picture? I have only just recently learnt that there is a term (or terms) to these types of people, and that there are indeed quite a lot of us. The one term I’ve been drawn to the most is: Multi-Passionate. (I just wrote a post about it, check it out here). As I say in my post, as soon as I heard that, and have read more and more on it, it all just made sense. I am Multi-Passionate, I have a wide range of interests and a lot of love for many things. 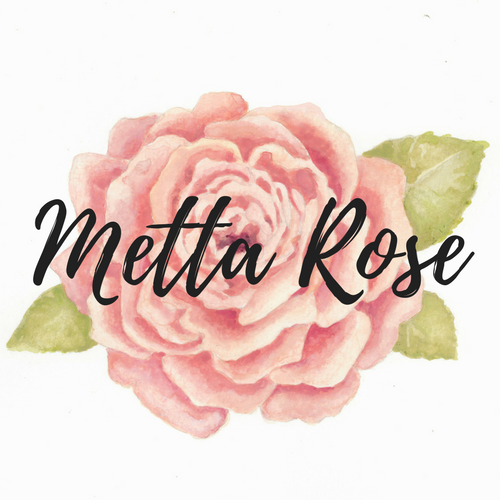 And from that, I created Metta Rose. It of course is me, my name (first & middle) but once I came to the realization that I can encompass all of my passions under one place, they, all together, felt connected & as one. The three constants throughout my life: wanting to be a mother, being involved in theatre & writing (in journals). So I now blog (when the time inspires) as my writing outlet. I mother 24/7 my three children, and I perform whenever I can. Photography I realize I’ve always done, without even knowing it, so I’ve stepped fully into those shoes now. Essential Oils is just a continuation of my already wholistic lifestyle I was born & raised with, and the whole empowerment & soul-full self piece has always been there, but hidden deep inside. It’s set free now. And that’s me. Thats my brand. This is my authentic, unique & cluster of passions mixed together, but complimenting each other so well. I thank you for stopping by, reading & coming along on my journey.